Cyber Monday sales have propelled the Torus water bowl up the best-seller rankings to become the #1 dog bowl in the Amazon Pet department. The Torus bowl, a product of New Zealand firm Heyrex, is an ergonomically designed, portable and sturdy self-dispensing water bowl for cats and dogs that provides fresh, carbon-filtered water as often as the animal desires. The original 2-litre Torus bowl is now joined by a smaller, more convenient 1-litre pet bowl that is perfect for cats and small dogs. 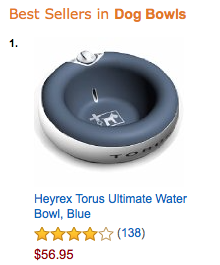 In the USA Torus water bowls are available through Amazon.